The Sharpeville Massacre was an important turning point for the South African Struggle Movement. It took place in Sharpeville, situated nearby Vereeniging in Gauteng (then-Transvaal). Organised by the Pan African Congress, with Robert Sobukwe at the helm, a crowd of thousands gathered at the Sharpeville Police Station on 21 March 1960 to protest the enforcement of Apartheid legislation restricting freedom of movement of black men and requiring them to carry pass books in so-called ‘white areas’ in South Africa. The police opened fire on a crowd of several thousand, killing 69 protesters and injuring 180 others, including 29 children. Many were shot in the back as they fled. Following the events at Sharpeville, the Pan African Congress (PAC) and the African National Congress (ANC) were banned on 8 April. They were only unbanned on 2 February 1990 when thenPresident F.W. De Klerk engaged in peace talks with ANC leaders to end Apartheid. Sharpeville Day became an important symbol for the struggle, and was commemorated by the banned political parties in exile as well as by the United Democratic Front, comprising a mass movement of groups seeking to end the Apartheid regime. The Black Sash was an organisation founded by white women in 1956 to oppose the apartheid legislation that sought to remove coloured voters from the common voters' roll, and subsequently evolved into an anti-apartheid activist organisation through to 1994 with community services, such as advice offices that helped especially women domestic workers affected by the pass laws. Ray Alexander was a trade unionist representing mainly black and coloured workers in industry, and an office bearer of the SA Communist Party. She and her husband Jack, also an activist, lived in exile for some 30 years after his banning. Their work intersected with that of many anti-apartheid organisations and they maintained an extensive archive. The material was held in secret behind their home, such that some of the contents are weather worn. 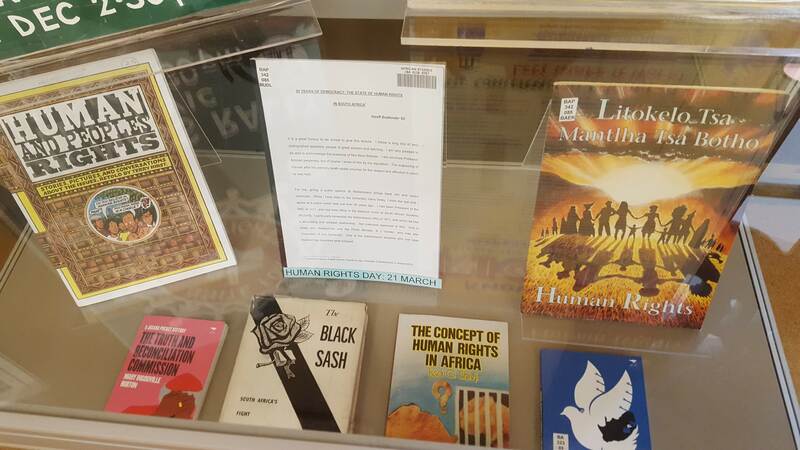 For more detailed information on our collections dealing with the South African struggle for human rights and dignity, please refer to the Access to Memory (AtoM) @ UCT site. A sample of our holdings is on display in the Reading Room of the Jagger Library.